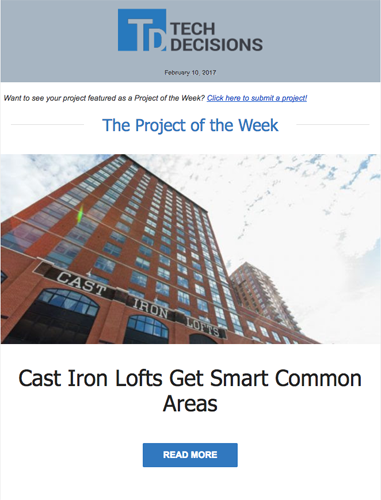 The smart system we designed for Cast Iron Lofts in Jersey City was highlighted by Tech Decisions as Project of the Week. 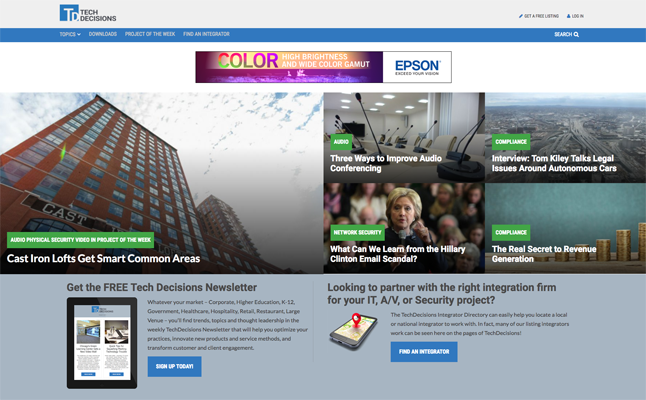 The project was featured front and center on their email newsletter and homepage, putting Serious Audio Video in the company of The US State Department, Hunter Roberts Construction Group and The School of Visual Arts. This e-mail blast led to a lot of recognition, industry wide, for the expansive system we designed for Cast Iron Lofts. When reaching out to Serious, resident safety and peace of mind were paramount, but Cast iron Lofts wanted the “wow” factor too. The company wanted residents to have all the amenities of modern living, and the systems had to be easy to use. The amenities at Cast Iron Lofts are the talk of the town. Residents love the user-friendly Elan system that controls the common areas. As the development company continues to develop new buildings, Serious is in contact with them about their continued needs. Serious technicians are contracted to provide ongoing service as necessary.